We hope you all had a great International Tabletop Day! We had a lovely time with most of our gaming actually taking place the day before on King’s Day, on with the birthday of the Dutch King is celebrated. We had an eight-player gaming day playing Muse, Ca$h ‘n Guns, Magic Maze, Robo Rally, High Society and Metropolys. On ITTTD we got a nice surprise from a reader named Fred who had sent us Century Golem Edition as a thank you! It’s is such an amazing looking game with giant cards, metal coins, big plastic crystals and great art that almost make you forget there is a light but very fun engine building game underneath it! The first game we played, it seemed a pretty solitaire game but in the second game, we started blocking each other and waiting until certain Golems were bought by others so we could grab some extra bonus points. We’ll probably be playing this a lot in the future, so thank you Fred! Another game we’ll be playing a lot the coming weeks is 7th Continent! If you’ve never heard of it, 7th Continent is a gigantic choose-your-own-adventure survival game in which you explore a continent trying to rid yourself of a curse. It has hunting, item crafting, a leveling up system but mostly it has a huge world for you to discover. I love discovering things in games and will not rest until every stone is turned over and every secret has been revealed! Alas, 7th Continent does not reward that type of playing. Every action you do requires you to discard a number of cards representing an amount of energy that action took, things like eating allow you to take back some cards, but hunting is a costly affair. This means you can’t just wander around and follow all the small leads on the map, I have to ignore them which is… gnnnnnnhh, very very hard! It’s still a great game but we’re figuring out the balance between exploring the great unknown and actually being able to win the game. What games clash with your personality? 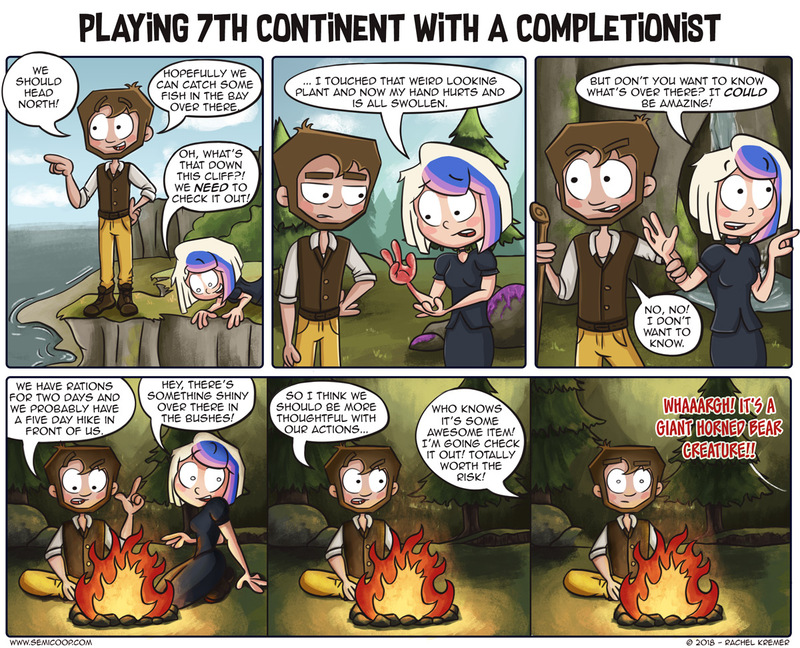 Haha yep that was exactly my thoughts on 7th continent. it feels at odds with itself this giant open map ripe with paths to explore and things to see yet you’re on a really tight clock that feels bolted on just so there is some tension in the game so it can be about survival too. My problem i’ve found is that the game is almost impossible to solve on the first play through which ok you think would be fine, except then on subsequent playthroughs you literally have to just repeat the motions and go no we don’t go that way cause it’s pointless we have to go this way so we can get farther then last time. It’s just so unrewarding and a bit of a let down. Whats worse is if you do any of the extra exploring the game can send you on a different path to the key points of the game which would be fine except the game breaks down as none of the clues show up to help guide you with what to do, you basically stumble around hoping to find something only to seemingly find a clue item with 0 flavor text or insight as to what it does or how to use it. Our first play we learned the rules on the noobie island and made some mistakes but were really enjoying it so we came back another day super excited to play again. The second day because of the path we took we ended up at the end without doing any of the middle parts just aimlessly flipping cards hoping we were doing what we needed. finally get to the end of our area to only to get a random item right as our first deck runs out with nothing telling us what to do with it. Then we shuffled the deck and drew a curse on the first challenge ending the game (we are definitely house ruling to seed that second shuffle to put the curse that ends at the bottom like 10 cards. the random curse ends the game and they are just anywhere in the deck is just a terrible rule it means the game ends up to 50% earlier then it should possibly). Everyone at my table was like that was pretty boring there was no story, no clues, no real ability to branch or make choices it felt like because of the timer, not because there wasn’t any choices, and at the time there was no story. We were all about ready to just sell it after how disappointing it was. But i went and cheated and looked up a walk through only to find out that there were all these clues and plot cards that were supposed to help guide us to what we were supposed to be doing. But because we didn’t take the specific route none of them showed up and our trip through a secret back door took us straight to the end area without any of the other items we needed to finish the mission. And since we were on a timer there was no way to go back to get them. And that is why i feel the game is at odds with itself, because these islands are huge with tons to explore and see and many paths to find and solve the puzzle but honestly you can’t see any of it because if you want to win the game forces you to take the very specific path to victory. Hey Matt, Just to make sure you aren’t playing wrong, drawing a curse from the Action Deck does NOT end the game. Only if you draw from the discard pile. 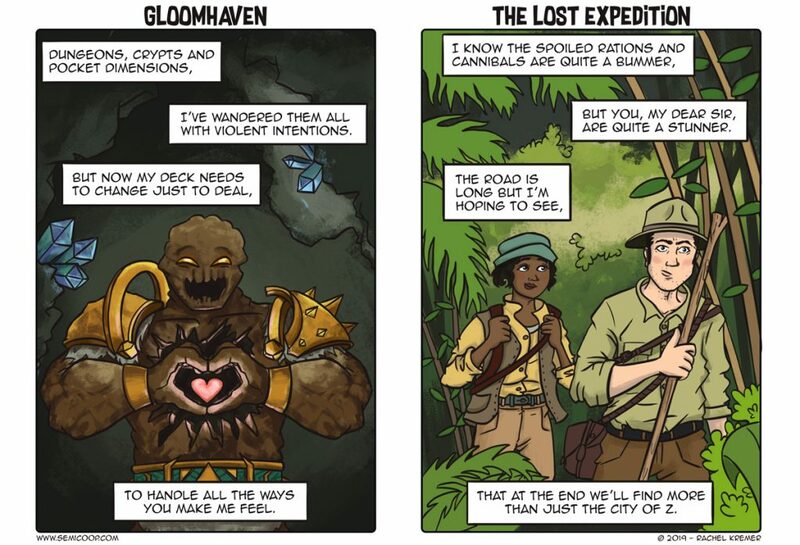 And did you notice the map clue for the VG curse on the back of the clue card? It help a lot. The 7th Continent is a very ambitious choose-your-own-adventure in which your group of explorers is trying to lift a curse that is placed upon them. Try to survive while getting attacked by monsters, solving puzzles and uncovering the secrets of the continent. 7th Continent is not available at the moment, but you can get more information on Serious Poulp's website.